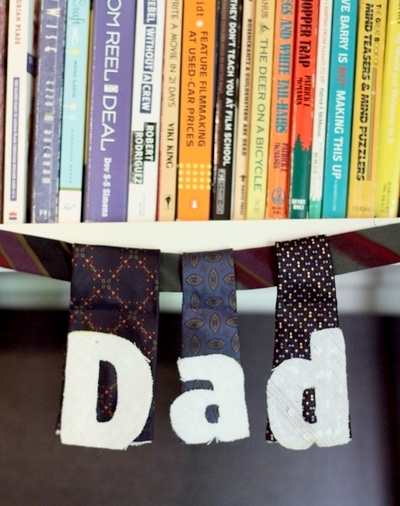 Use recycled ties to create this unique Father’s Day banner that says “Dad.” Recycled ties are looped over a skinny tie to create free-moving flags that allow you to scoot the letters around on the bunting. 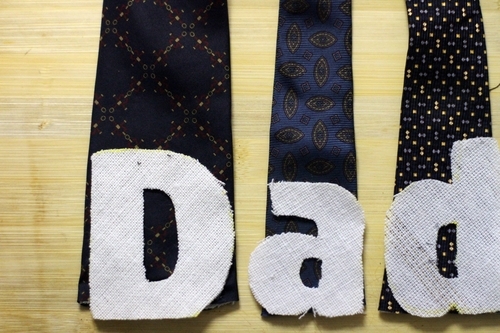 I hope you saved your tie scraps from yesterday’s Dad’s Tie Bunting project, because if you did, this project will take you ten minutes to complete. If not, it will probably take you about thirty minutes, so either way, it’s not too bad. The Letters: Print letters on cardstock, and cut out. 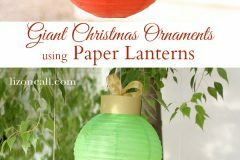 Trace around them onto light-colored scrap fabric or tie inserts. Cut out. 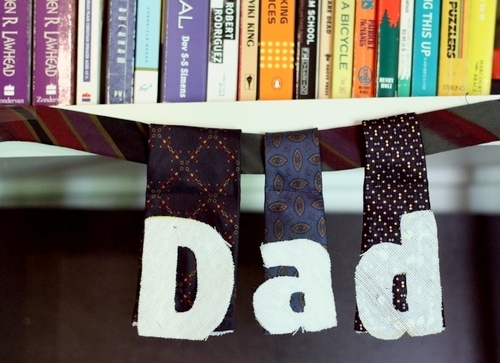 (If you saved your letters from the Dad Tie Bunting, you can skip this step because you already have the letters.) It might help if you starch your fabric, or fuse it to some fusible interfacing to make it stiff. It’s easier to cut accurate letters with sharp, pointy scissors (like embroidery or fingernail scissors). Glue the letters to pieces of tie. 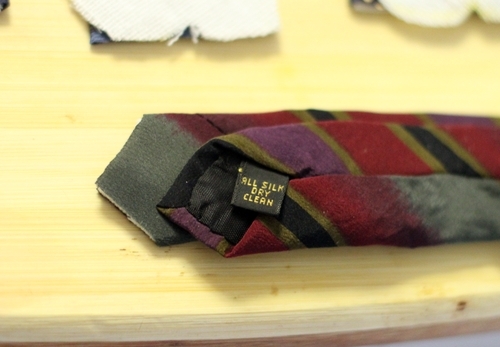 I had pieces of ties left over from previous projects. 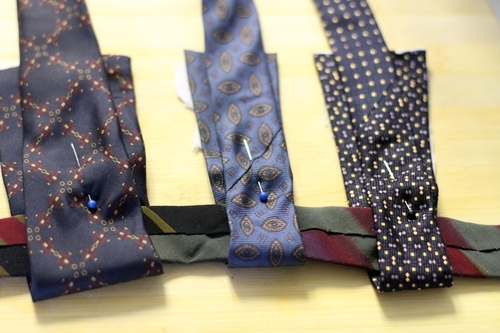 If you are starting with unused ties, you can use the bottom of the tie for that distinctive tie shape. 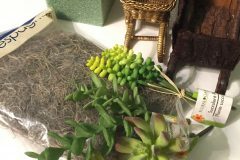 Cutting the garland: I used the skinny end of a tie for the garland. I just cut the tie off at about 30″ and then matched the shape of the cut-off end to the finished end. I didn’t bother finishing the cut end. 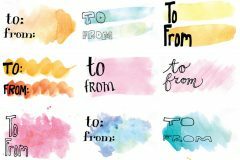 Assemble the garland: Fold the prepared letter flags over the garland. Pin, and sew across the flag, making loops. 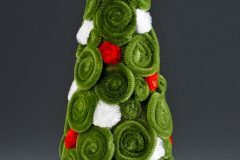 Sew acrpss the ties (below the garland part, so they can freely slide along the garland). 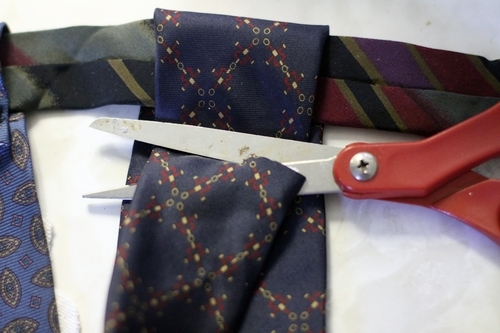 Trim excess: cut the extra length of tie off the back of the loop. Aww, this is so much fun! Thanks so much for the great Dad-centric idea. I’ll be linking. This is so fun! 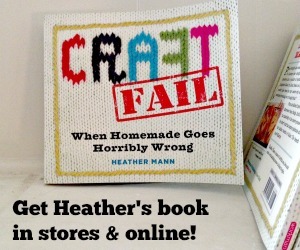 I would like to make something similar and I’d love to link to you–is that okay?